You don’t really have to wait to buy that SUV: just take a car loan. Oh, your colleague went to Paris last month and the pictures are breath-taking? Just take a personal loan and book your tickets. With so many avenues to take a loan, money is not a problem, but ask yourself: do you want to spend it all now, and pay for it for many years later, or do you want to save for it now and spend it later? We do want you to be able to buy all the comfort and happiness that your hard earned money can buy, but we don’t want you to live in just the present. You should be able to enjoy your money not just today, but also tomorrow and even after you no longer earn. So you need to save before you spend. 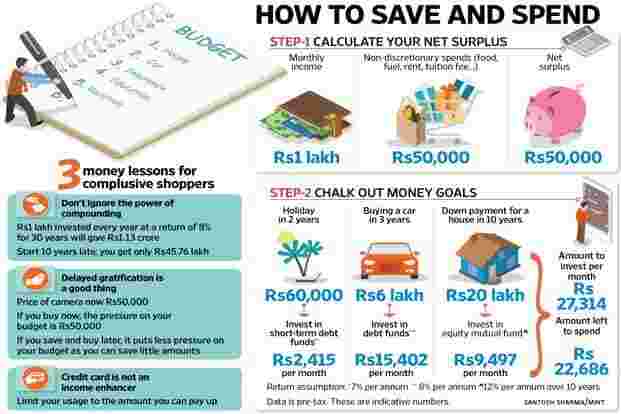 But should you save by cutting back important spends and being miserly or should you just save a fixed amount every month and spend the rest? Here are three steps that will give you answers to these questions. How much is available to spend will depend on your net surplus. Draw up a list of non-discretionary expenditure. These are boring but necessary spends such as household supplies, food, school fees and rent. Subtract this from the money you make and you get a net surplus. “Map your income on one side and non-discretionary expenses on the other side and net off your income. This is the surplus from which you make necessary savings first. What is then left is the amount for discretionary expenses and savings," said Shyam Sekhar, chief ideator and founder, iThought, a financial advisory firm. But how much do you save? This will depend on two things: your goals and asset allocation. Save for a comfortable tomorrow, and according to Shweta Jain, founder, Investography Pvt. Ltd, a financial planning firm, how much to save depends on how much you want to spend tomorrow. “Drawing up financial goals helps in quantifying the amount you need to save," she said. Money goals are important, even if you have just started working and the money is tight but your calendar of social do’s is full. “No one really teaches us how to manage money once we start earning it. We are left by ourselves or our elders’ or friends’ guidance and learn only by making mistakes," added Jain. Build your goals from the word go. You don’t have to start planning for retirement right away, although that would be good, just start with small goals like saving for a car or a holiday or even for an unforeseen event. As you build that discipline and you move up the career graph, you will find it easier to invest for bigger goals like retirement or your child’s education. Build that discipline now. Drawing up goals is the first step to understand how much you need to save; it’s the asset allocation that helps you close the loop. “You don’t have to save a lot of money but just the right amount if you have your asset allocation in place. So for a long-term need such as retirement, you should look at allocation more towards equity given they outperform all other asset classes over a long-term horizon,"said Surya Bhatia, managing partner, Asset Managers. Suppose you want to buy a house 10 years down the line and you want at least Rs20 lakh for the down payment. Work the math backwards. In the absence of an investment, it would mean you need to save Rs2 lakh every year, but if you invest in equities—equities are capable of generating double-digit returns over a long-term horizon—assuming a 12% return (pre-tax) on investment you only have to invest about Rs1.14 lakh every year. According to Jain, one of the reasons people find it difficult to save is that it’s so much easier to spend. “Spending feels so good. There is hardly any feeling more powerful than swiping a card and not caring, at least at that point, to pay," she said. But if you can control your impulses, plan your spends and provision for it, you will save yourself from a lot of wasteful expenditure. Delayed gratification is one of the biggest money lessons you need to learn by heart. Why? Because when you postpone impulse shopping, you have more at your disposal that you can choose to save or spend. In fact, the earlier you save the more you benefit: you give more time for your money to compound. Unlike the previous three steps, this rule is the toughest to implement because it’s intangible. But it’s a sure shot winner to help you cultivate the right money habits.